Last weekend Pierce Watters and I hit the trail to promote Planet Stories (and other Paizo books) at Book Expo America, the largest book trade show in the country. After an ill-fated move to Los Angeles last year, the Expo has returned to its home at New York’s Javitt’s Center, where it will reside for the next several years. We arrived in New York on Wednesday and set up the Paizo booth on Thursday in anticipation of a Friday morning opening. Once again we were in the Diamond “Alley,” which is to say a row of several booths organized by our American book trade distributor, Diamond Book Distributors (or DBD, if you prefer). Unlike in previous years, this time Paizo was Diamond’s only non-comic publisher at the show. We were joined by such luminaries as Marvel Comics, Dark Horse, IDW, and a passel of smaller comic, graphic novel, and manga publishers. Traffic was noticeably down this year (the economy and the impending collapse of Borders has really hurt the publishing industry as a whole), with many giant publishers scaling down their booths or electing not to display at the show at all. Just about everyone I spoke to was peeved about this, but there was more than enough stuff to see and do without them. To me, the giant multi-imprint booths are always pretty difficult to navigate. As a tiny booth in the Diamond Alley we often have as much or more of a noticeable presence than, say, Tor or Ace or Del Rey, who are often nearly impossible to find since they are all owned by huge publishing houses with gigantic booths. As usual, we had piles and piles of free books on hand to give away to buyers, librarians, and the assorted book lovers who come to the show. We managed to give away about 400 books, including 80 copies of our newest Planet Stories release, Robots Have No Tails, by Henry Kuttner. Reaction to the new look for Planet Stories was almost uniformly positive, with many buyers and attendees congratulating us on the pulpy look of the new books. The covers for both Robots and The Ship of Ishtar received a lot of kudos, and I think the new look will help the books find a bigger market than they have managed to date. We ran a huge library promotion at the show, and though I don’t know if any of the many buyers I spoke to about it will bite, but I remain hopeful. Now that we’ve been displaying our line for three consecutive BEAs, we’re starting to develop a bit of a reputation. For the first time many retailers attending the show knew about Planet Stories and talked about stocking them in their stores. It’s nice to shift from “here’s our deal” to “nice to talk to you again,” and I see it as part of the ongoing process of making Planet Stories a sustainable, profitable business venture. Very few people (relatively speaking) open our books expecting to see comics, and it seemed like a near-majority of booth visitors were at least familiar with our company (though I heard some VERY interesting pronunciations of “Paizo”). Overall I feel like we’re getting a bigger and better reputation each year, and we’re becoming a more and more important part of Diamond’s overall operation, which is nice. 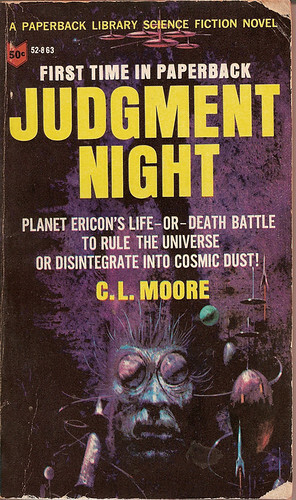 I finished two Planet Storiesesque books on the planes to and from New York: Judgment Night, by C. L. Moore, and A Princess of Mars, by Edgar Rice Burroughs. I’ll have full reviews soon on my sister blog, Paperback Flash, as soon as I get back from my current trip to Minnesota and have some time to scan up the covers. The upshot is that Judgment Night is a really excellent book filled with the lush description common in Black God’s Kiss and Northwest of Earth, but with a much more active protagonist who prefers taking control of her own destiny rather than passively watching as interesting things happen around her. The opening chapters on a pleasure-moon are particularly noteworthy, as is the later destruction of that world in the final chapters of the book. Fun stuff, and very much in the vein of other material we’ve published. There’s not much to say about A Princess of Mars that hasn’t already been said. It’s a far, far better book than I expected (I last read it years and years ago and had forgotten almost every detail), especially given that it was originally published in 1912. You can see how it inspired dozens of imitators, and reading John Carter’s first voyage to Mars is like seeing the blueprint for countless hacky ripoffs that have followed in the century since its original publication. There are flaws. The narrative relies WAY too much on coincidence, and by the time Carter randomly crash lands his airship at the feet of his old buddy Tars Tarkas near the end of the book, I’d just about hit my limit. Happily, the book was over very shortly thereafter, and I moved immediately on to The Gods of Mars, which I’m still working on. More about all of this stuff as I scrape together some additional free time to blog about it. Until then, subscribers should keep their eyes on their mailboxes and readers everywhere should keep their eyes on the local bookstores. Robots Have No Tails is on its way!